Just finished chapter 12. Four more chapters to go in this one, but I’ve hit some speed bumps that have slowed down my progress. Between an unexpected illness and some late in the month screeners that I have to review for Rogue Cinema before I get the next issue out, it’s limited the amount of time I’ve been able to spend writing. Still, I’m plugging away at it whenever I can and I anticipate having the next book out within the next couple of weeks at some point. Not much else to report really. I just wanted to throw a quick update out there. Here’s a little teaser from Unseen Things: Immortals. This is from Mike and Jeremy’s first assignment. The pair went to the doorway and then just stopped. They didn’t just stop moving, they stopped everything. Breathing, brain activity…you name it. Inside the chamber there was in fact a queen, but she was unbelievably massive. The chamber itself was massive, taking up the entire top of the mound and she filled a good three-quarters of it. Her main body and head looked similar to the other insect people, only she was absolutely enormous, her features were more exaggerated and she didn’t seem to have any real awareness of what was going on around her. It was like her only purpose was to be an egg creator and all other functions were secondary to that. She had a gigantic protrusion that extended out from her lower back that was semi-translucent and had the shadows of hundreds of eggs showing within thanks to the back-lighting coming from the windows. Some of the insect people were taking the eggs from her as they would come out, while the others would attend to her needs as far as food and water. There were a few who were actively cleaning up the goo left over from the egg expulsion by drinking it in, as they did with the water when they transported it. What they did with that goo after it was cleaned up however was a bit of a mystery. I was just interviewed about the Unseen Things series on Wayne Clingman’s Blogtalk Radio show. You can listen to the playback of the interview here or check it out in the embedded player below. By the way, the person in the picture in the player is Wayne, not me. Unseen Things: Immortals is now in process! I’ve started work on the fifth book in the series, Unseen Things: Immortals. Last night I did the cover and all the other graphics I need for it, and today I blew through the first chapter, on very little sleep mind you, in about two and a half or three hours. Unseen Things: Revenge is here! It’s here folks! Book 4 in the Unseen Things series is now available directly through the official website here, as well as through Smashwords, Amazon and soon other retailers as well. Synopsis: Word had spread amongst the tribal leaders in the Faranox dimension of the human raid on one of their towns in which many of the Agaronin were killed and all of their slaves were freed. Now, five tribal leaders have banded together and are starting work on a massive new settlement in order to better defend against the human threat. 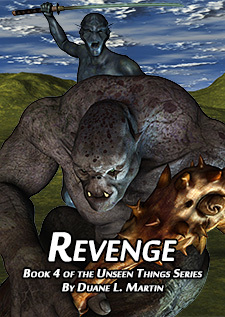 Unseen Things: Revenge is the fourth book in the Unseen Things series. You can also find the book on Goodreads if you’d like to add it or review it. Unseen Things: Revenge is now complete! Now the proofreading begins. Yes folks, in just two weeks I’ve managed to pound out a 92,142 word novel. How? A lot of coffee and a hell of a lot of missed sleep. So now the proofreading process begins, which usually ends up taking around five or six days, and then I have to come up with a good one sheet for it and go through the other stuff I need to do before I publish it, and then it’ll be out there, as well as being available right here on the website like the others. I’m pretty single minded when it comes to the things I’m working on, so I’m thinking I’ll have it ready to go by the end of next weekend, which would be January 19th, if not sooner. I’ll update the website and all the pertinent sections after the book is published.